This eight-session study of Paul’s letter to the Philippians explores the centrality of Paul’s faith in Jesus Christ, his love for the Philippian church, and his joy in serving both Christ and their church. Paul’s letter reminds us of his special relationship with Jesus and calls us into a renewed relationship with Christ, too. Each session concludes with thought-provoking suggestions, making it an ideal resource for Bible study groups as well as individual readers. 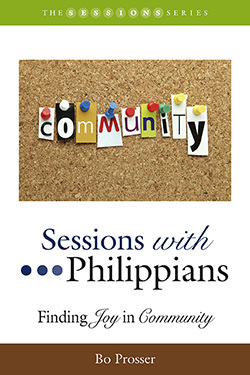 The Sessions Series is preferred by a number of churches seeking to help people build their Bible study skills. Many groups enjoy studying the Bible book-by-book. This popular approach helps a group discuss a book’s basic themes, learn how to interpret that book, and then wrestle with it’s meaning for their lives. Bo Prosser is the Coordinator for Missional Congregations with the national Cooperative Baptist Fellowship in Atlanta, Georgia. He previously served churches as adult educator and associate pastor. He is a much sought-after speaker and “enter-trainer.” He is the co-author of Building Blocks for Sunday School Growth and several other titles. Introduction: What a Fellowship! What a Joy Divine!